I was invited by a friend to join a day trip round three sites in the North West including a hill fort, some early mines and the stone remains of a burial mound. Getting into town to meet the coach almost proved a difficult proposition because the first bus only just got into the city centre in time. From there we first went to the hill fort. 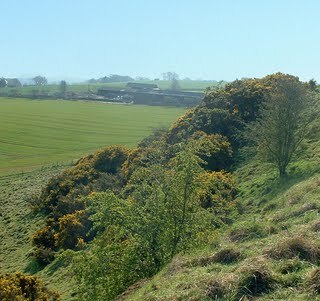 The picture above is of the hillside on top of which the hill fort’s remains stands with two rampart lines protecting them. The photographs I’ve taken of the earthworks for the ramparts don’t do justice to their height. Any assault on them, especially if a pallisade and defensive ditches were present with defenders fighting to protect the fort, would have been a dangerous business. Up on the hill top in the late morning the wind was bitter and the buzzards circulated overhead. Although little work has been done on the site it has been estimated that 1200 people may have been living within the 400m by 100m site. From there we went to Alderly Edge where we looked at a variety of copper mine workings, springs and other remains. The sandstone cliffs drop away creating striking features. After several hours walking round the various features the sun was starting to make itself felt. In the warm, late afternoon we went to see a long mortuary enclosure The Bridestones. The remains were excavated by the Victorians leaving just the stones in place without the earthworks that once covered part of the site. It was possible to get a pretty good impression of the site. After a lot of walking and fresh air I’m sure I’m going to get a really good nights sleep tonight. Hopefully I’ll get a chance to edit some more of the photographs I took and I’ll post them in the next few days.